Clifden Medical Practice is Connemara’s longest serving medical practice, originally established in 1950 by Dr. Michael Casey and continued today by Dr. John Casey and Dr. John Casey Junior. In 2010, we amalgamated two practices in Clifden and established Clifden Medical Practice. 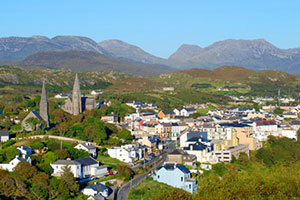 We serve Clifden town and the surrounding rural areas. We offer a huge array of general practice services to our patients. We are a group practice with both male and female practitioners, a practice nurse, physiotherapist and support staff. We cater for all age groups and try to deliver the best possible care in a friendly and caring environment. Sarah Casey, Chartered Physiotherapist, provides a private physiotherapist clinic in the Clifden Medical Practice. She works alongside our three general practitioners and practice nurse offering physiotherapy where needed for patients to get the best possible recovery. Since 2011, Sarah has developed a successful practice in musculoskeletal care, sports injury rehabilitation and post surgical physiotherapy. Weekdays: Monday – Thursday from 6pm to 9am. Weekends: Friday 6pm – Monday 9am.